Arthritis in its different forms, together with rheumatism or rheumatic diseases, is the largest complex of chronic diseases in our society. Sooner or later it affects nearly everyone in one way or another. The very fact of this widespread nature of arthritis and rheumatism shows that there is no medical solution for it. 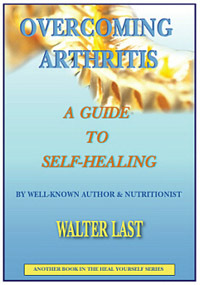 Therefore conventional medicine prefers to regard it as natural that we develop arthritis as we get older. However, there have been many traditional or “primitive” societies where old people reportedly did not get arthritis. Therefore it cannot be natural, but rather an outgrowth from an unnatural lifestyle. To this effect natural therapists and progressive medical practitioners stress a return to more natural living conditions, and especially an appropriate and healthy diet as a precondition to prevent and overcome arthritis and rheumatic diseases. In addition to sanitizing the gastro-intestinal tract and strengthening the immune system, we need to eliminate the systemic microbial infections which are commonly at the base of this disease complex. In this way you should be able to prevent and overcome your arthritis regardless of your age.